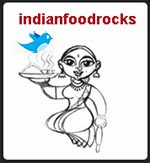 Indian Food Rocks: Struck by Lightning! I think god is great...luck has its own place. 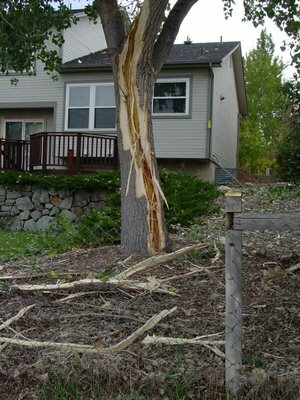 Hi Manisha -- I remember all the talk about lightning when I was planning the trip to Colorado. Guidebooks said it's the number one natural hazard there. Glad you were all safe under cover. O H - M Y - G O D! Oh god.. day by day I am getting scared about your place Manisha. We had some thunders(like small bomb sounds) few days back in midnight. But don't know if it struct anywhere (did I say, all this time my hubby was sound sleep. He didn't even beleive me when I told him about the thunders next day :D). I am getting very very scared of your place by reading your posts. Snakes, mountain lions, lightening...oh god..how do u live there? BTW..we also experienced frightening thunder a few days back. That too in the middle of the night, felt like entire apartment would fall on my head :(. Its so scary. Meena, I agree with you. Homes have been struck and burnt down by lightning in old Louisville. 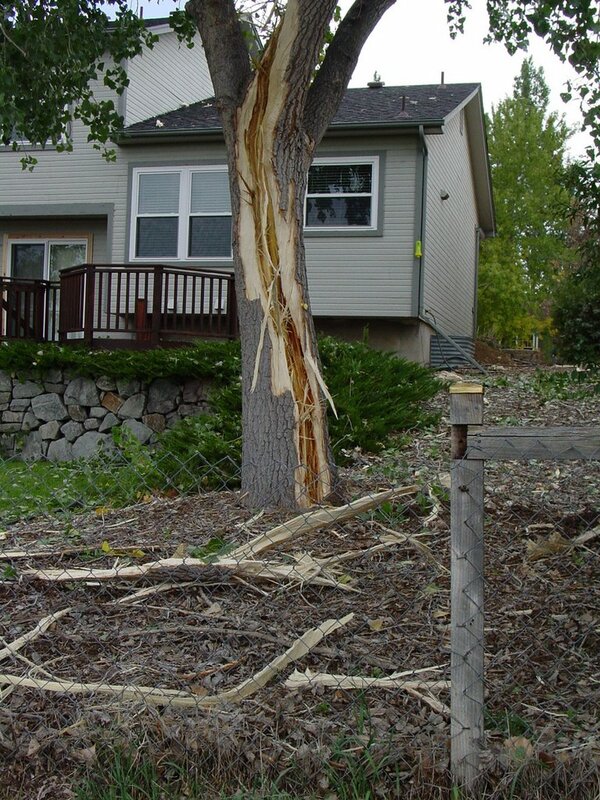 The homeowner whose yard this tree was in and their immediate neighbors were very very lucky. The tree must have just exploded! Nabeela, it certainly seems that way, doesn't it? And, thank you! Sree, that's all I was saying when I was looking at the scene around me at the bus stop. My friend told me about another tree a couple of miles away on a farm that has been hit by lightning. She said it was bent over. At least this cottonwood is still standing but I think it will need to be chopped down. I wonder if it will make good firewood for winter. Shilpa, raw nature is very powerful and sometimes we need incidents like this to remind us that we are very 'small' in comparison to the power of natural elements. How do we live here? It's bee-yootiful! Truly it is! Visit Colorado and you will know what I am talking about! Manisha! !I am glad you are all safe and sound!! You can fix things always; with our families intact, we can deal with anything!! :D Take care!! It rained like crazy here too but not much damage!! Asha, apparently that's quite the norm here in CO but for the sake of Caitlyn, Lulu & Tony we'll pretend that it just never happened! I was reading the stuff on your website, God Bless You & your Family..Thank God the lighting was a little away.. I had a similar experience, lightning struck a transformer which inturn struck me..well..alive and kicking but I am treated for AvascularNicrosis and blood supply problems.